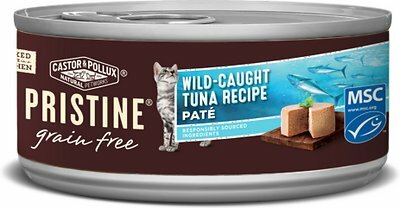 Feed your favorite feline purposeful, complete nutrition with Castor & Pollux PRISTINE Grain-Free Wild-Caught Tuna Recipe Pate Canned Cat Food. The only complete line of pet food made with responsibly sourced ingredients, this wholesome and delicious pate starts with wild-caught tuna that is responsibly caught by a certified sustainable fishery. Real organic produce is grown without synthetic fertilizers or chemical pesticides, on farms that care for the earth. All that healthy, whole food nutrition is prepared for your kitty right here in the USA because better ingredients make better food for your furry friend’s health. The very first ingredient is wild-caught tuna that is responsibly caught by a certified sustainable fishery. Tuna, Water Sufficient for Processing, Chicken, Organic Chicken Liver, Dried Egg Product, Organic Dried Peas, Natural Flavor, Calcium Carbonate, Organic Cranberries, Organic Dried Alfalfa Meal, Sodium Phosphate, Potassium Chloride, Choline Chloride, Minerals (Zinc Amino Acid Complex, Iron Amino Acid Complex, Manganese Amino Acid Complex, Copper Amino Acid Complex, Potassium Iodate, Cobalt Glucoheptonate, Sodium Selenite), Vitamins (Vitamin E Supplement, Vitamin B12 Supplement, d-Calcium Pantothenate, Vitamin A Supplement, Niacin, Vitamin D3 Supplement, Riboflavin Supplement, Folic Acid, Pyridoxine Hydrochloride, Biotin, Thiamine Mononitrate), Salt, Guar Gum, Salmon Oil, Taurine, Organic Rosemary, Yucca Schidigera Extract, Organic Sage. My cats absolutely hated this! when I put it in their dish, they smelled it and just walked away. I let it sit there for 30 minutes and no way would they eat. So I took it away and gave them the Turkey recipe. That they gladly ate. 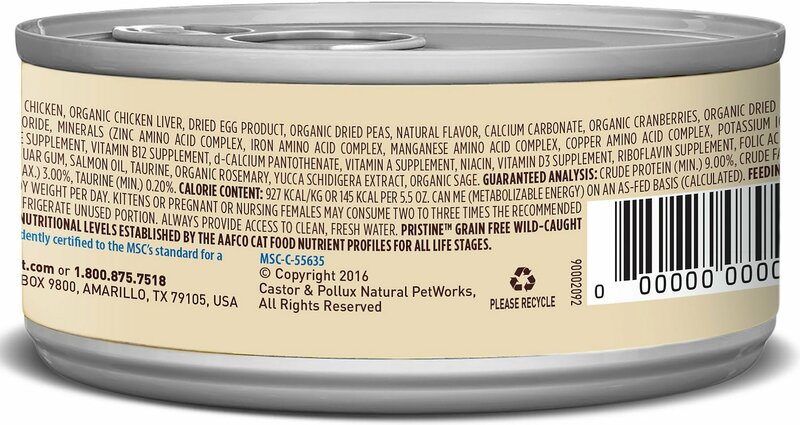 This food has a little less protein and moisture content than I prefer to feed, but my cats really liked it.